The winners of the art competition for the 2014 calendar of the European Partnership with Municipalities Programme EU PROGRES called “Responsibility Towards Nature Has No Limits” are Amina Ćurkić, a student of the Novi Pazar High School, Davor Filipović from the “Nikola Tesla” Technical School in Surdulica and Nemanja Đurović, a student of the Priboj High School. 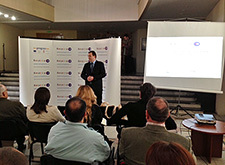 EU PROGRES Manager, Graeme Tyndall and Deputy Mayor of Vranje, Bojana Veličkov presented the prizes – a laptop, tablet PCs and digital cameras to the 12 best students. 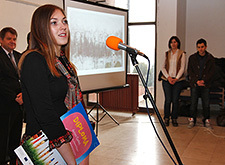 High school from Surdulica won the best school award at this year’s competition and was rewarded with a computer and a projector in order to improve the quality of teaching. 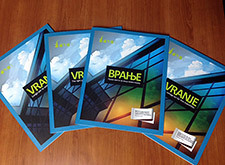 From now on, the City of Vranje can present the advantages for doing business it offers in a new promotional publication “Vranje, the Right Place for Your Investment“, developed as part of this city’s branding project financially supported by the European Union and Government of Switzerland through the European Partnership with Municipalities Programme EU PROGRES. The first Sour Cherry Festival in the village of Petrovac near Leskovac opened formally tonight and will go on until Saturday, 6 July. 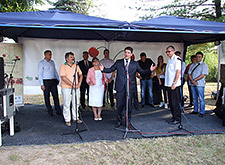 This event, which will gather fruit producers and processors, is part of the Sour Cherry Festival project implemented by the Civil Society Organisation “Sour Cherry 016”, as lead partner, with support from the European Union and the Swiss Government through European Partnership with Municipalities Programme – EU PROGRES and the City of Leskovac. The topics of the info meeting with representatives of local economic development agencies and other budgetary institutions of Novi Pazar, Raška, Ivanjica, Nova Varoš, Tutin and Sjenica were how to improve project planning, development and financing application.